That hasn’t stopped the world’s best designers from splashing it all over anything they could get their hands on this season. Now brown is inescapable. It’s everywhere. And having witnessed its rebirth firsthand, it actually has a lot going for it. Seventies connotations aside, brown is warm and surprisingly flattering. It also pairs well with a wide array of colours and lends itself nicely to other trends currently sweeping through menswear, particularly textured fabrics and mid-century style. The issue lies in how to wear brown. For all its plus points, it’s notoriously tricky to get right without looking like you’ve just stepped through a time portal straight from the set of Starsky and Hutch. But it can be done. Pulling this divisive colour off in a way that doesn’t make you look like you’ve started taking style cues from your high-school geography teacher relies on a number of factors: picking the right shades, knowing what garments they work on, and having a knowledge of how to pair them with a variety of colours. 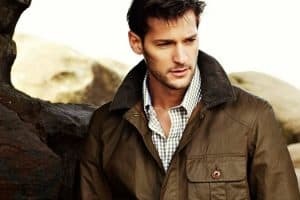 Those fair skinned men who are constantly fretting about being washed out by their wardrobe can skip this section – you’ll be safe in almost any shade of brown. Everyone else, pay close attention. Are you guilty of listening with one ear to your paler skinned pals moan about being washed out by white and beige? Well, it’s finally your turn to be cautious about colour. If you’re tanned or darker skinned and pick the wrong shade of brown, from a distance you’ll look semi-naked at best, full birthday suit at worst. Luckily, it’s simple to avoid faux flasher status. Just check the shade of the item against your skin tone: bring the garment up to your forearm to see if it’s significantly lighter or darker than your skin. If it’s not, stick it back on the hanger and start again, using these nine failsafe brown garments as your starting point. Too many men have outerwear collections which solely consist of navy, black and grey. Don’t get us wrong, they’re great, but ignoring the wealth of other colours on offer is an unforgivable style offence in our book. We love camel coats as much as the next outerwear fanatic, but if you want to take your top layer next level, brown is where it’s at this season. “Brown is a very classic masculine colour,” says Delphine Ninous, a freelance creative director with the likes of Belstaff on her CV. “It can look evaluated and edgy at the same time.” When it gets colder, a big brown oversized coat is your sartorial safety blanket. Avoid anything too tailored and look for dropped rounded shoulders. Get tactile with your textile, too. Shearling, fleece and rich wool all look great in brown. A brown winter coat is also extremely versatile. Worn over a cream crew neck knit and jeans you’re ready for the weekend; sat on top of a grey suit for work it gives off strong Richard Gere in American Gigolo vibes, which is a life goal as far as we’re concerned. It’s no coincidence that brown is enjoying a revival at the same time 1970s style is getting a second crack at the whip. And that means that when it comes to brown suit, the internet’s your oyster. Brown tailoring may not be many people’s type on paper, but trust us (or Ryan Gosling – a confirmed fan), you might just swipe right for this season’s handsome suits in chocolate, caramel and tan shades. As always with tailoring, you’ll need to consider cut (take it to a tailor), but shade is just as important. If you want to go full suit, dark brown will get the most wear – and it’s not a flash-in-the-pan fad buy, either. “Brown has always been a classic choice in menswear tailoring,” says Danny Ching, senior menswear designer at Aquascutum. 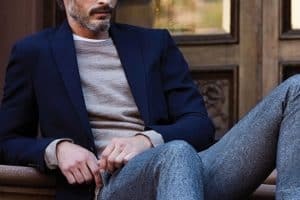 “With new ways of styling tailoring, it has re-emerged amongst the countless grey and navy suits men continually wear to work, social events and weddings.” Timeless yet not overdone? That’s menswear gold. Particularly since brown tailoring is hard to mess up. Ching says: “Brown is a rich, versatile colour that helps to enhance and enrich contrasting colours that it’s paired with. Given its neutral underpinnings, it can be styled with virtually any hue, though it tends to work particularly well with shades of blue and green.” Also try tonal tans and dark neutrals including black. And because brown is slightly more casual, it works nicely with knitwear when you want to dress your suit down. Here in Britain, you’ll often hear something particularly frightening referred to as “a brown trouser moment”. However, you don’t have to be attempting your first skydive or watching The Exorcist in order to don a pair. In fact, brown bottoms are a solid everyday alternative to jeans or more traditional navy or beige chinos. The secret to getting it right is in how you style them. You need to add a few hits of contrast though, to avoid looking like a cosplay Jedi knight. Biedul continues: “Adding an element of off-white, such as a shirt worn under a knit or a pair of white trainers, will help break up the colour block.” If it’s totally tonal, it’s totally easy. Brown knitwear is pretty unloved. We get it. When done badly, it can look like you’ve raided the lost property box or remind you of the oatmeal cardigan you suspect your grandfather never washed. Done well, however, it’s suave and very much on trend this season. The key to mastering a brown sweater is all in the texture and gauge of your fabric. Fine-gauge brown knits have the unparalleled ability to appear limp and lifeless, with all the appeal of a used teabag. Look for heavy weaves, texture, pattern and long hair designs. “Brown is the perfect colour for autumn and winter as it nods to what’s going on outside,” says stylist Phill Tarling, who has dressed the likes of Tom Hardy. Try pairing a rust-coloured sweater with mid-wash denim and desert boots. Or camel with black jeans and layered with a white T-shirt would work nicely too. The main thing is to make sure that if you’re going to match with black, the shade of brown shouldn’t be to dark. Brown knitwear won’t just pair handsomely with your wardrobe staples – it can get a little more lively with the right treatment. Tarling continues: “If you’re looking for a more trend-led way to wear brown knitwear, take a leaf from Mother Nature and team with moss green trousers to nail two of this season’s most important colours in one outfit.” Stick on a pair of white lace-up sneakers and job done. We’ve already established that brown is the perfect colour for playing with different textures. And this is something jackets are equally suited to. By putting the two together, you can guarantee you’re onto a winner, whether you favour a bomber, biker or field jacket. A brown jacket is a bona fide autumn essential. Keep it classic with suede, an Oxford shirt and chinos. Or go for a sportier vibe by opting for a brown varsity or Grease. To steer it in the other direction, try pairing one with a rollneck (you’ll never catch a Hell’s Angel in one of those) smart trousers and a pair of black derby boots. A solid selection of shirts is the foundation upon which to build the rest of your wardrobe. With that in mind, they should be not just well-fitted and good quality, but also varied. A brown shirt is a great addition as it can work in several different ways. First off, it can be worn on its own, buttoned up and paired with either smart trousers and shoes or jeans and trainers. Secondly, it can be worn as a light top layer, open over a plain T-shirt for a casual look. Thirdly it can be worn as a additional layer under your winter coat and on top of a roll neck. And last but not least, as part of a tonal outfit. In order to get the tonal look right, try pairing a chocolate-coloured shirt with a camel overshirt, you can contrast this with a pair of off-white trousers, while tying it all together with some black Chelsea boots. When picking a new blazer, your go-to colours most likely look a little something like this: black, navy, grey or, if you’re really feeling crazy, a bit of beige. However, by ruling out brown you’re denying yourself the opportunity to begin functioning on a whole new level of nonchalance. Brown tailoring radiates an aura of casual cool that the usual suspects will never be able to replicate. For a fresh, autumnal spin on smart casual, try teaming a brown blazer with a tonal roll neck and contrasting the two with a pair of white or off-white trousers. You can then tie it all together with a premium white sneaker. As we’ve said, brown will always look good as part of a tonal outfit. 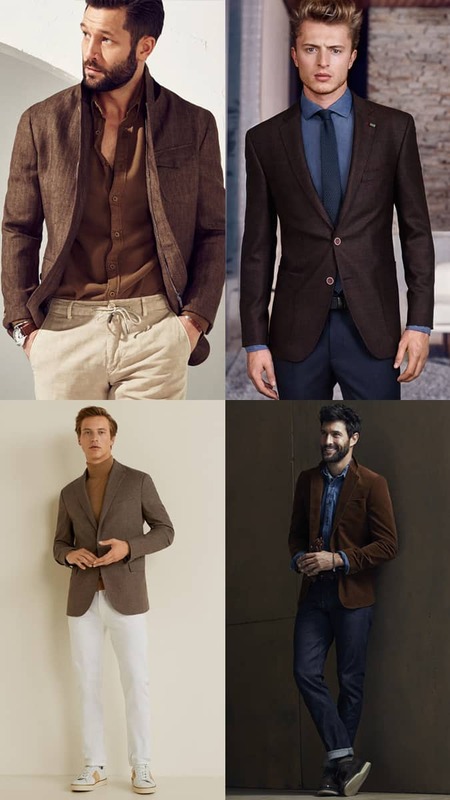 However, brown blazers (and tailoring in general) also work very nicely with denim and chambray. A brown blazer, chambray shirt, tonal blue tie and navy trousers are a surefire showstopper. After NSFW content, we’re quietly confident “how to wear brown shoes” is up there in Google’s most searched terms. While things will change slightly season on season, there are some hard and fast rules, which you’d do well to commit to memory. Brown may not be the most common colour when it comes to neckties but once you see how good it can look it’s difficult to see why. Rocking a brown tie is a neat way to make a style statement without sticking out with a sore thumb. It lets people know you’re not afraid of experimenting with your wardrobe, but also that you know where to draw the line in order to keep things tasteful. At first thought, it’s tricky to imagine what might work with a brown tie, but in reality, the options are plentiful. Brown lends itself well to blue, so pairing with a navy or pale blue shirt or tailoring (or both) is always going to be a good option. For a more winter-friendly option, pick a knitted tie and team it with a crisp white shirt. You can then build on the theme of texture by wearing it with a thick wool suit. Incorporate a pattern for bonus points. Remember, ties aren’t just for the office. You can dress the look down by switching the blazer out for a more casual jacket to make things a bit more relaxed. Try something like a smart bomber jacket for best results. 9 Facials For Men: Can They Make You Better Looking?